Far Sawrey is a beautiful village in Cumbria. 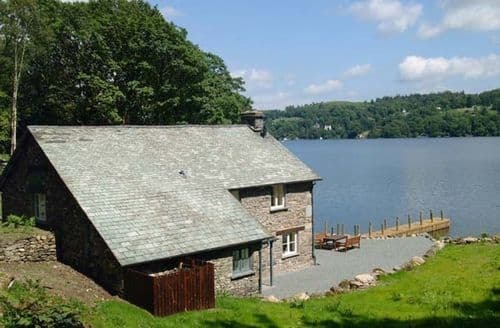 It sits between Windermere and Esthwaite Water in the Lake District National Park. 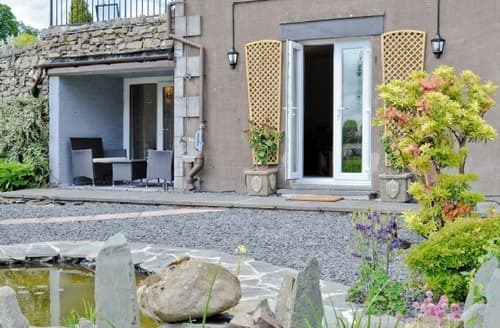 Surrounded by amazing views, this is an idyllic place to enjoy a relaxing cottage holiday. 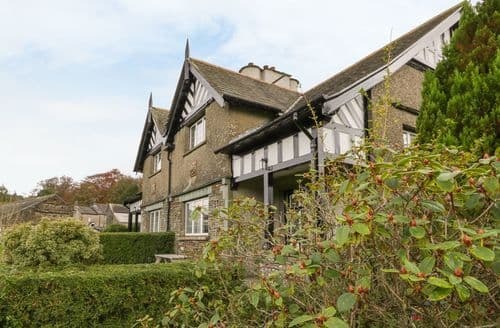 The Lake District is one of the UK’s most loved National Parks, and Far Sawrey is a great base for exploring it. 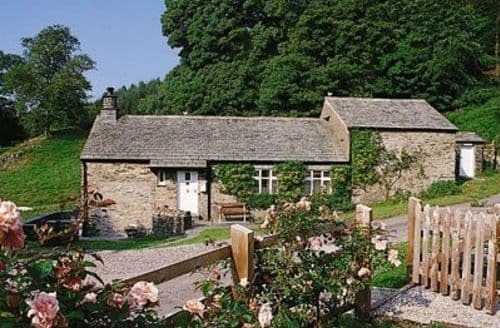 Nearby you will find woodland, tarns, lakes and plenty of paths to walk. It is an equally great place to explore by bike too. You’ll also find a few local attractions to visit including a National Trust castle and Hill Top, where Beatrix Potter once lived. 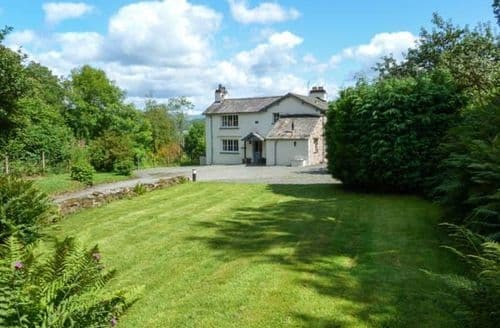 Far Sawrey is certainly a magical place for a holiday. 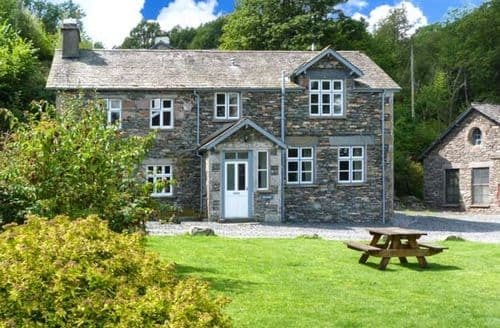 What our customers are saying about our Holiday Cottages In Far Sawrey To Rent. "This comfortable apartment has lovely views over the fields from the lounge and small (double) bedroom patio doors but, being in the basement, is darker in the kitchen and master bedroom which do not face the garden and fields. The central heating is controlled by the main house and came on morning and evening but there is a smart electric fire in the lounge for other times and an oil filled timer radiator in the small bedroom so it was warm enough. The only ventilation in the latter and the lounge is by opening the patio doors but there is a deep canopy over the bedroom door. There is a lovely sitting out area just outside the flat for those sunny days, if you are lucky to get them, with a view over rolling pasture land complete with cows and sheep, and accompanying sounds and smells (which didn't bother us). The shower is good and there is a powerful extractor fan in the bathroom and big heated towel rail. It would have been useful to have instructions for the appliances (dishwasher, washer/dryer and microwave) in the kitchen. Washing up by hand was a bit cramped with the single sink being in a corner by the fridge/freezer. The provision of crockery, glasses etc wasn't ideal for 4 but the new owner quickly sorted out the essentials when asked, and was keen to ensure we were happy and had everything. Being partially in the basement, it was perhaps not surprising that the wi-fi was not very good. The new owner had only been in several weeks when we arrived and made us very welcome. It seemed (e.g. by the large delivery of furniture from John Lewis) that they were still in the process of getting fully set up but, apart from the few things mentioned, we had everything we needed for a comfortable stay. The Cuckoo Brow Inn (2 minutes walk away) is a very good unspoilt pub both for drinks and food. Likewise, 10 minutes walk away is the Tower Bank Arms providing excellent hospitality, ale and food but you need to be there by 6pm to get a table in the small, welcoming bar. The Loweswater Gold beer brewed a mile or two away at Esthwaite was beautiful. A milkman from Town End Dairy calls daily and can deliver a wide variety of things - toilet rolls, eggs, yoghurts, tea bags, refuse sacks, Strathmore mineral water, fruit juices, bacon etc mostly at very reasonable prices. 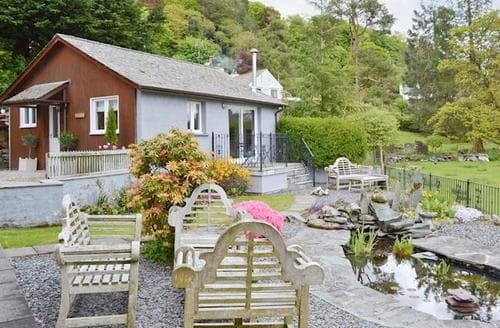 It's just a few minutes drive to the ferry to Bowness and another world altogether from this quiet little corner of Lakeland. Care is needed when leaving the house due to a sharp bend in the road but there are convex mirrors. Also if parking round the the back, near the apartment, there is a tight corner to manouvre round - not ideal for large cars but there is easier parking at the front. There are lovely walks right from the door - just bring a large scale OS map. We particularly enjoyed walking up the lake shore to Wray Castle then back via High Wray and Claife Heights and tarns - a 9.5 mile walk with 2 tea rooms and a pub at the end! This little corner of Lakeland is quiet and beautiful and, whilst we were there, seemed to enjoy a favourable micro-climate whilst most of the cloud and rain hit the mountains further north. We understand the garden pond may be removed in 2016 making it more suitable for children. Understandable, but a shame as it's an attractive feature. We would certainly like to return here for another holiday. Thank you Damian." 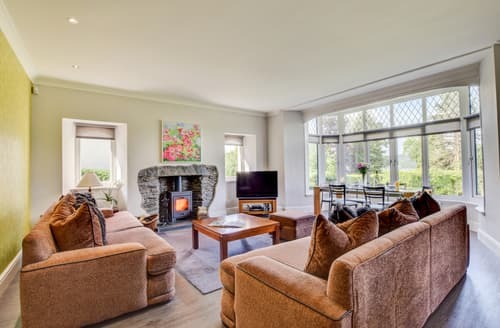 "The location of S87091 is superb and the cottage itself is beautifully appointed with lovely, comfortable furnishings. It was spotlessly clean with a great bathroom and additional shower room. We appreciated that there was loads of cupboard space for our own food and drink and an excellent utility room. The house is very spacious and light and has spectacular views. However we did have some niggles: There was no hot water on the first morning, until we'd consulted the house book, but we expected that it would have been left on for us. It took us several days to get warm [it was -2 at night] and the heating was set to switch off at 9 p.m. We did light the wood-burner and fire but that didn't help in the bedrooms. There were no mirrors in the bedroom so it wasn't possible to dry hair in front of a mirror. There was a wall mirror in the bathroom but positioned so high I could only see the top of my head! [Admittedly I am shorter than average.] There was a shaving mirror but not suitable for hair drying in the bathroom. Also the coat hooks were set so high my husband had to jump up to attach the coats. The 'welcome page' of the house book included directions for departure, we were instructed to strip the beds on departure, which we don't mind doing but felt we might have been invited to do that rather than be presented with that expectation on arrival. We do appreciate that the turnover time isn't long to clean and prepare the cottage for the next guests. Although I'll say 'yes' to publishing feedback I'm not happy that the niggles are included." 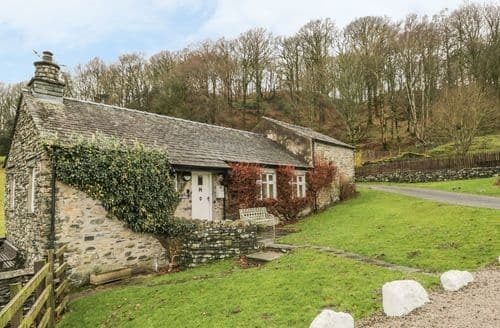 "Lovely little cottage in a great location for walking and exploring the area. The views are fantastic and it's really peaceful. The cottage was really cosy and comfortable although the sofa might be a bit small if you are bigger than average but was ok for us. The place was clean and well equipped for our needs and the daily visit from the dairy to deliver supplies was handy. The wifi connection meant that we could research the local area for places to go although we were unable to connect for more than 2 or 3 days. This wasn't a problem as we weren't expecting wifi but if you can't live without it I'm sure the owners would sort you out with any problems as they were really helpful and polite. My only really gripe (although it is a small one) is the vehicle access and parking. I've got a small car and it was tight to manoeuvre and the layout of parking meant it was almost impossible for us to get our car out if the other parking spaces were occupied with a large car. We opted to wait until the other guests had left each morning before we ventured out. It wouldn't stop me from staying here again but I do think that it would be better to make people aware of the access restrictions prior to booking." 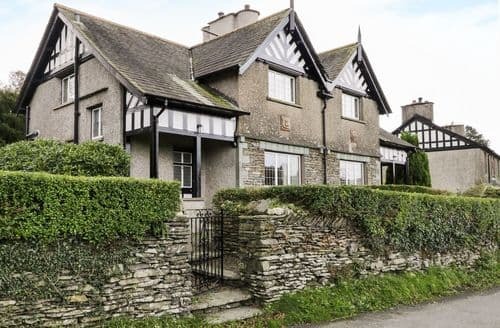 "Lovely location with some beautiful walks and great views. Local pub very handy, just a few minutes walk, and very dog friendly for our excitable young dog. They made us very welcome and the food was great. Just two things that I felt worth mentioning. The garden area needs some work. Large area of dirt and mud that I think is yet to be turfed. Not great when you have a dog that likes the dirt! Also I think the bedrooms would have benefited from a mirror to make it easier when drying hair etc. I dried my hair in living area where there is a mirror so not a huge problem Facilities in the property are brilliant. The use of Sky Q an added bonus for the evenings. Everything very clean. Beds very comfy"
"Ideal location if you want to get away from it all however a quick ferry takes you to Bowness/Windermere where shops are aplenty. A two minute walk to the small local shop and pub which provides excellent food. Overall the cottage was far better than we could have hoped for, very clean and comfortable with all the facilities anyone could need. We were shown to the outage then left alone for the entire week although the owners were close by if needed. 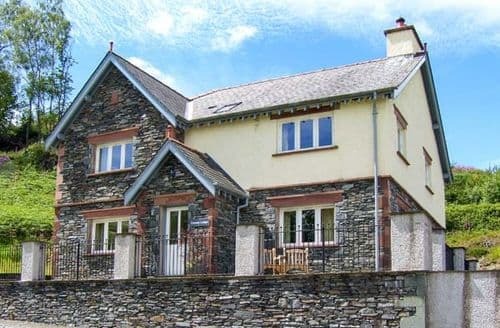 If you want to get away from the world the location is ideal with magnificent scenery, the cottage is the icing on the cake. 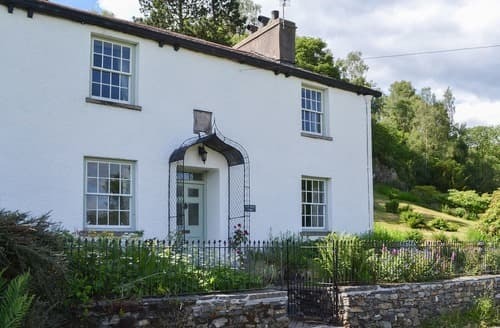 We really don’t feel that the cottage could be improved it is perfect exactly as it is. April 2012."